I have read a lot of posts from bloggers that don't really recommend using Promoted Pins on Pinterest. Nevertheless I decided to try it out for myself and see how it worked out! 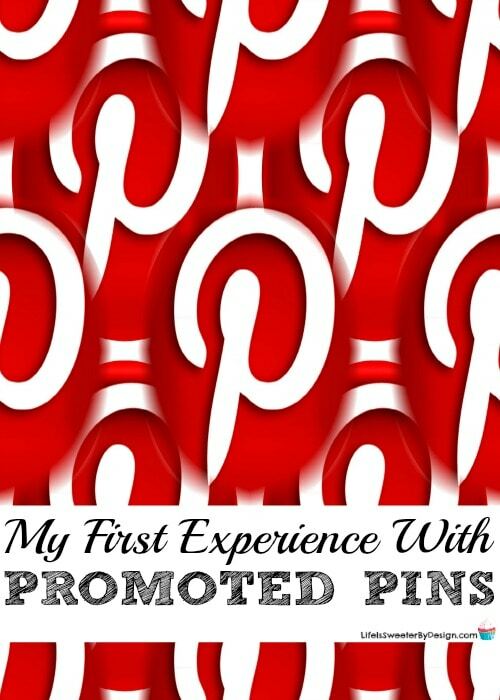 I can honestly say that my first experience with Promoted Pins on Pinterest has been pretty positive! I will walk you through what I did and I hope it will give you some information to help you decided if this is a route you want to take for your blog. I have an Easter Cake Round Up post that I felt could gain some steam on Pinterest this time of year. I decided to try it out as a promoted pin with a small budget and just see how it did. I went into Promoted Pins. The options are for Engagement Campaigns or Traffic Campaigns. I felt like traffic was more important for me at this stage so I chose to do a Traffic Campaign. I can honestly say that I just felt my way along in setting this traffic campaign up. I just added the information that was asked for and if I wasn't sure about something I went to the help center for more information. I did a daily budget of $3.00 for 8 days. I also had to choose how much to pay-per-click and I put $0.10. This wasn't a lot at all and I got some messages saying that my pin wouldn't be promoted during higher traffic times because my bid was so low…but I was working on a very small budget and I was okay with that. Here is a screenshot of how my promoted pin did for those 8 days. As you can see the pin got an over all 62.59K impressions. That is a lot in my opinion for one of my pins. I had 285 clicks over to my blog plus 165 repins! 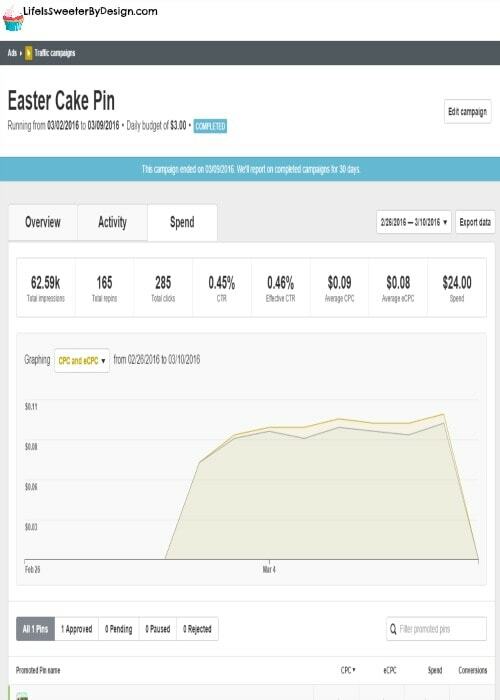 The average CPC (cost per click) came out to be $0.09 and that seems pretty cheap! I spent a total of $24.00 for this promoted pin. The good news is that the pin still seems to have some momentum and I am still getting decent traffic to my site from this pin even a week later. I don't know if promoting a “seasonal” pin is the best idea, but I feel really good about the results. I would say I will probably promote more pins in the future as the blogging budget allows. I am in no way an expert in this area of promotion, but wanted to share my results! I would love to hear if you have done any promoted pins and how it went for you! Be sure to read about Blogging Resources that Actually Add Value to New Bloggers and Quick and Easy Ways to Optimize Your Blog Posts for More Traffic! Thanks so much for commenting Janine. I like to hear how things work out for other bloggers and wanted to share my experience! I really appreciate you sharing!! I’ve done a couple – some hits and some misses. One thing my blogging coach taught me was to never pay for traffic unless you are selling a product, which I think makes a certain amount of sense. However my last one had some big fat affiliate links in it and while it did get some traffic to it, I got zero sales. So I guess it is just trial and error, but I do plan to continue using it. I can definitely see the reasoning behind only paying for traffic if you are selling something. I am not selling anything at this point…just kind of wanted to see how it would work and bring some extra traffic in. Thanks for sharing how it has worked for you!! I hope to be more focused if I do another campaign! This makes total sense Adrian! One would have to have a product, a collection/product/service they are launching or selling (or have affiliate links to try to at least break even on the investment). Those are great points Karla! It is hard to spend the money for traffic…will be anxious to see what your products are when you release them!